Ready to try the exciting world of online trading? You are a few minutes away from joining more than 100,000 traders and getting your own account. Open a practice or live account in a few simple steps. Get one-on-one training*, access to our learn centre and free trading signals. Trade with no slippage, guaranteed stop loss, and fixed spreads. Use our unique tool dealCancellation** to undo any losing trade within 60 minutes of opening it. For a small fee, you can avoid big losses, and keep yourself protected against the unexpected. We started with the launch of the first web-based platform in 2001 and have since seen over 1,000,000 registrations & $1.5 trillion + in trading volume. Our excellent service and unique trading conditions have earned us over 30 global awards including Most Trusted Broker & Best Trading Platform. 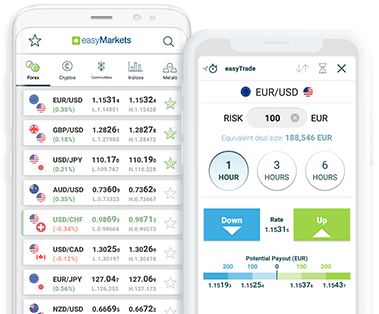 Trade with easyMarkets during all the big events, with unchanged trading conditions. A few recent examples: All Brexit events, SNB crisis and UK Election. *one-on-one training is only for live accounts.